What a crazy busy three months! Between traveling, schoolwork, and some personal stuff, it’s been near impossible to keep up with blog reading, let alone writing. But things are settling down some and I can fill you in on the few projects I’ve managed in that time. So, when we left off, I was on the first step of testing my black and lime green theory. The next step brought some changes to the dress pattern and then the fabric rainbow caught my eye and more dresses were born. I’ll go into the details in the next post but I think my black and lime green theory might be morphing into a black and bright color theory. We’ll see how it shakes out. It is now layered and ready for quilting. I can hardly wait to get it all finished. I might be farther along on that if it weren’t for a sudden urge to knit that gripped me last Sunday. So instead of quilting I’ve been knitting. I’ll show you when it’s finished. The dresses and the color are wonderful. Can’t wait to find out what pattern you used. 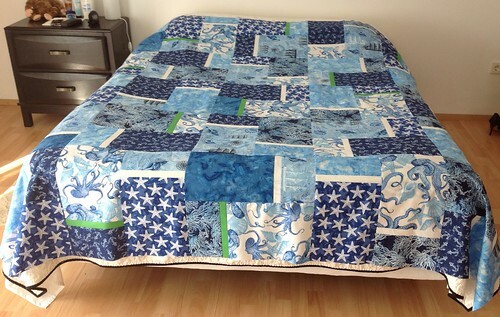 The quilt is gorgeous too. Thank you, Faye, for the compliments! So glad to see you back – you were missed. Very interested in the black wiith bright colors potential – sounds right up my alley. Love the quilt with the splash of green. The dresses are gorgeous and the quilt is beautiful. It was so much fun shopping with you. Thank you, Darlene, I really enjoyed shopping with you too. Great quilt top. And looking forward to seeing what you are knitting. Thank you, Gari! I’ve been knitting like a maniac every day so it should be ready to show soon. Good to see you back blogging. Since finding out I am a bright winter, too, I have been looking forward to seeing how more of your wardrobe is coming together. I love the turquoise dress, especially that collar. It feels very Jackie Onassis to me. Please share which pattern it is! I have been moving forward with sewing some deep cobalt suit separates. I’ll be making a turquoise skirt suit soon, too. I think Kelly green and lime are going to be part of my wardrobe, too. I think I must be following your neutral and bright color idea, too. Thank you for the kind words. The pattern is a modified McCall’s 6355. I can’t wait to see your bright-colored creations. This is so cool – to be able to compare notes with another Bright Winter sewing her own clothes.